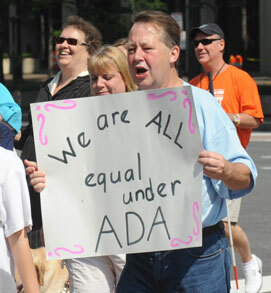 A new goal of the NCIL ADA / Civil Rights Subcommittee is to have every Subcommittee member take an ADA Basics course. We think everyone should, but especially people working at a Center or SILC, or serving on the Subcommittee. I started the course myself last weekend and have re-learned (or I’d rather say, remembered) several things already that I can use regularly in my work. I have been working with the ADA for twenty years, but through this course I am getting a great refresher on the parts of the ADA I may not work with every day. Those of us who have a particular interest in the ADA and work on ADA-related issues on a regular basis tend to gravitate to our favorite piece of the law. Some folks know a great deal about the employment provisions in Title I, while others (like this writer) get into the accessibility standards and the built environment. Still more earn a living making sure Title II state and local government entity programs are accessible when viewed in their entirety. No matter what our concentration ends up being, we all should have started with a basic foundation of understanding of the ADA that this course provides. For folks just starting to get into the ADA, its implementing regulations, and the 50,000 or so pages of helpful information and interpretations there are out there, the ADAbasics course is a great place to get started in a self-paced, comfortable learning atmosphere. The course provides a great foundation for anyone considering offering advice in the community, to protect the credibility of all of us. Hopefully anyone wanting to offer ADA expertise in the community would seek out additional training on things like surveying for ADA accessibility or reasonable accommodations in the workplace, but this course is a great place to start. From my perspective as Co-Chair of the ADA / Civil Rights Subcommittee, the ADAbasics course is a minimum requirement we will now ask all our ADA / CR members to commit to completing. The course is made up of self-paced modules that you can leave and return to once you have filled out the free registration and established a password for your course access. The site was produced by the National Network of ADA Centers, and I understand there is a certificate provided upon completion. I’m working on earning mine now at www.adabasics.org. How about you?